Self care month began boring, turned ugly, then finished nice and smooth. I successfully avoided all alcohol and sugar, which was surprisingly easy to do. I don’t really even miss them at this point, and I think I might just continue avoiding them indefinitely. I also succeeded in eating veggies at every meal, something I will definitely keep doing. I feel less hungry, more energetic, and I just really love the flavor and variety of the vegetables I’ve been eating. It’s kind of a pain to wash and prepare them, but I think I can build in a few more efficiencies that will make that part easier. The daily walk outside hasn’t become a habit. I have focused more on spending time outside, which has led me and the kids to play outside more and to do more outdoor activities than we otherwise were doing. We’ve been hiking as a family every weekend, which has been a wonderful time and a chance to get together with friends while exploring the Wasatch Front. I’ve also begun sitting outside with my tea or coffee and watching the sunrise. I don’t get to do this every morning, but I’ve been doing it at least three times a week for the second half of the month. Having this quiet time outside really helps me feel ready for the chaos that comes after the kids wake up. The sitting outside in the wee hours has been facilitated by the earlier bedtime I finally managed to keep for the second half of the month. I don’t always make it to bed by 10:30, but since I started going to bed earlier, I’ve made it to bed no later than 11:00, except on the nights my daughter was ill.
Like with my mindfulness practice in August, I found that during September, I once again kind of hit a wall about two weeks in, at which point I had a little crisis and then turned a corner into a more comfortable place. The more sleep thing turned out to be wonderful once I finally started doing it. It also helped to start getting better about keeping my mindfulness resolutions, which I’d kind of set on the back burner for the first couple of weeks. Breathing and being aware of judgments has really helped me keep things in perspective. I’ve learned a couple of important and new things. One is about the value of self care when things are going well as a way of building up reserves to be able to cope when things become more challenging. When my daughter was ill last weekend, I was pleasantly surprised at how calm I remained and how energetic and capable I felt. I don’t know how long those reserves would have lasted had her illness been longer than it was, but they got me through a few late nights and restless sleep. The other thing I’ve learned is that I don’t think my goal with this project is really happiness, per se. I don’t have a problem with being happy, and I do hope that making these changes will help me get more joy out of life, but I don’t feel that my endpoint is “happiness” anymore. I want to increase my awareness in the moment so that I can have richer experiences. I want to improve my ability to express my emotions—including happiness—and share them with my children in a constructive way. And I want to build up my life and deepen my connections in such a way that my life is more peaceful and fulfilling. I think the likelihood that these things will lead to happiness in the long run is fairly high, but I don’t think the short-term result is always happiness. I don’t want to use happiness as my goal in each moment because I think that might lead me astray. For example, Wednesday night I felt tired. We spent a lovely afternoon with friends at Red Butte Gardens, walking around in the sun, playing in fountains, sharing a picnic lunch. Wednesday is also the day I’ve got planned to visit the gym and do my little workout. After all of our fun, I found myself thinking that feeling so worn out would be a reasonable excuse to skip my gym visit. I wanted to hang out at home and read my book and get up-to-date with my favorite blogs, maybe check my blog stats every five minutes. But I chose to go to the gym. When I returned, I was still tired, but I felt relaxed, strong, and content. I don’t think I would have had as positive a feeling after spending the evening in front of a computer screen or even curled up with my book, as lovely as that would have been. And I have the added satisfaction of putting that healthy habit in the bank so I’m ready for those days when I need a little extra energy. Had I looked only at “happiness” as my goal, I don’t know that I would have made the same choice. Another example is facing emotionally painful situations. In my experience, when confronting unresolved trauma, disagreements, or just negative interactions, things get worse before they get better. If I went for happiness only, I may decide that I have enough happiness already and choose to cut my losses and avoid the painful situations rather than working through them to find greater meaning. I’ve read a number of books this month. The Magicians by Lev Grossman, Bluebird: Women and the New Psychology of Happiness by Ariel Gore, The Search for Fulfillment by Susan Whitbourne, and The Geography of Bliss by Eric Weiner. I’m also about halfway through Viktor Frankl’s Man’s Search for Meaning, which so far is blowing me away. Tomorrow I start a new month! Check back for the plan for October. I’m excited and cautiously optimistic. It will come and softly sit on your shoulder. This theme has been coming up for me again and again in the past weeks: If you strive for something, you can’t reach it. The other day at the gym, I listened to an interview about writing with Lynda Barry on To the Best of Our Knowledge. Barry teaches writing classes and was discussing with interviewer Steve Paulson the methods she encourages her students to employ. Every task she gives them is designed to silence their inner critic. She wants to get her students back to an attitude of playfulness about their writing. Paulson asked her, well, at some point, though, you want to produce something good, you want to be a successful writer, right? Barry said that, if she thinks about whether her writing is “good” or not, it’s after it’s finished. If you start out writing with the idea that it has to be good or that you want it to make you a success, you’ll not be able to get anywhere with it. But if you write playfully and for no purpose but that of creating, you may well find success. I think it was Anne Lamott who talked about this in Bird by Bird, the phenomenon in which a second novel is a lot longer coming than a first, simply because now you’ve got something to live up to and that desire to be good—or to be better—gets in the way of creativity. When I first read and followed the activities in Julia Cameron’s The Artist’s Way, I became annoyed because so little of it seemed to focus on actually working on projects. What on earth could a daily walk have to do with writing? Writing was one thing I absolutely couldn’t do while walking. And what was all of this about making collages and writing three pages a day that I’d never look at again? How would I have enough time to write if I did all of this stuff? At the time, I sort of took it on faith that the professor who recommended the book to me had done so for a reason, and I just trudged through the activities. But now, years later, I think I’m finally starting to understand the sneaking up on creativity that Cameron was trying to lead her readers to. I did on [sic] the work once on “I should be happier”. In a nutshell, I realized that this belief actually moves me away from happiness because when I am not happy and I believe this thought, I judge myself, compare myself, feel broken, etc. I lose sight of all happiness I have when I believe that thought. Without the thought I am free to be happy or not, but free – and much more likely to be happy, because there is nothing to fight against, no guilt, etc. Like I said, this is coming up for me everywhere now. When I first think of these things, the first thought that comes to my mind is, “Oh, crap. And here I am doing a Happiness Project.” But then I take a step back and a deep breath and remember that all I’m doing is trying to set the stage for a peaceful, meaningful, joyful life. I don’t tell myself, “I will be happy. I must be happy. I should be happy.” (Or at least I don’t set out to say these things. Sometimes they just kind of pop in there.) Happiness isn’t the goal; it’s a guiding principle by which I judge my actions and resolutions. I look at my life and see that there are many things that hinder my mood and my relationships, especially with my children. I’m grouchy when I’m tired. Well, let’s see what happens when I get more sleep. I feel annoyed and even fearful when I find myself wishing the moments away during the day. OK, so I’ll take a deep breath and be in the moment, and see how that changes things. I do hope that, by doing these things that are kind of tangential to happiness, I might just find myself feeling happier. But if not, I’m still eating healthier, sleeping more, yelling less, deepening relationships. These are things worth doing regardless of the size of the payoff in bliss. If you take away from the midst of you the yoke, the pointing of the finger, and speaking of wickedness, if you pour yourself out for the hungry and satisfy the desire of the afflicted, then shall your light rise in the darkness and your gloom be as the noonday. And the Lord will guide you continually, and satisfy your desire with good things, and make your bones strong; and you shall be like a watered garden, like a spring of water, whose waters fail not. And your ancient ruins shall be rebuilt; you shall raise up the foundations of many generations; you shall be called the repairer of the breach, the restorer of streets to dwell in. If you do x, y, and z for the purpose of receiving good things in return, you’ll be disappointed. You do these things because they’re the right things to do, and if you do this work in that spirit, you just might get even better things in return than just a transient elevation of mood. I’m looking for something deeper and broader and longer lasting than my own happiness. I’m looking to “raise up the foundations of many generations” the only way I can: by working on the things I can reach. At the beginning of this project, I found myself hung up on the idea that happiness results from virtuous action. I think I’m starting to understand this concept a little better. In Man’s Search for Meaning, Viktor Frankl tells a story about working with his fellow concentration camp prisoners out in the bitter cold with inadequate clothing and no subcutaneous fat to help insulate them. They would look forward all morning to the time they would get to spend a few minutes warming themselves at a small stove. When the time came, their pleasure at this small amount of warmth was immense. They were practically joyful, even in the middle of such brutal and miserable circumstances. But there were guards who seemed to derive equal pleasure from denying the prisoners this comfort. Not only would they not let the prisoners warm themselves, sometimes they would knock over the stove and scatter the coals through the snow. While virtuous action leads to happiness, someone who appears happy has not necessarily become so by engaging in virtuous action. It’s like how hard work can lead to material success, but material success isn’t always the result of hard work. The best bet appears to be focusing on the virtuous action rather than on the happiness. But what’s the difference, really between the two types of joy, that derived from an appreciation for the relief of suffering and that derived from the infliction of suffering? The sense I get is that the latter type involves a bitter core of experience. It’s not a joy originating from the soul, but one that lays on the surface, protecting the person experiencing it from opening themselves up and exposing their inner selves to the light. The former is a simple joy, but it’s an honest, transparent joy. Clearly, for Frankl it was also a sustaining joy. Do I Have Kale Between my Teeth? 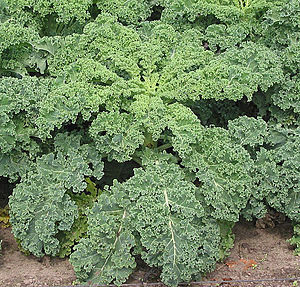 I’ve developed a bit of a love affair with kale in the recent past. Back in the day, I never ate a green leafy unless it was iceberg lettuce, which really is neither particularly green nor particularly leafy. I started branching out and eating leaf lettuce and baby spinach in college (that’s what a liberal arts education will do to a person). When my husband and I were living in the South, I started experimenting with collards. Large hunks of pork and hours of cooking were the secret to getting me to try this Southern delicacy. The Moosewood Restaurant New Classics cookbook brought us healthier collards recipes, like their Spanish Bean Soup and Caribbean Beans and Greens Wrap. Soon after, Vegetarian Times got us eating broccoli raab (also called rapini) in a recipe that had a sauce of pureed white beans, sun-dried tomatoes, and rosemary. There might also have been pecorino romano cheese in there. In California, we joined a CSA, which introduced us to a whole other world of green veggies, most of which we turned into frittatas for the first year we bought a share. After that first year, we expanded our repertoire to include gratins. Both of these fell by the wayside when I stopped eating dairy. My love of greens went dormant. Then a couple of years ago, through the magic of Facebook and my friend Abigail, I discovered Green Smoothies (OK, I didn’t discover them any more than Columbus discovered the New World. But they were revealed to me and it was like a discovery. Or perhaps more like a revelation). I tried them first with just a little bit of “safe” greens, like chard. Not bad, but they didn’t really float my boat. Then fate stepped in and broke my blender, giving me an excuse to buy a super-powered Vita-Mix. 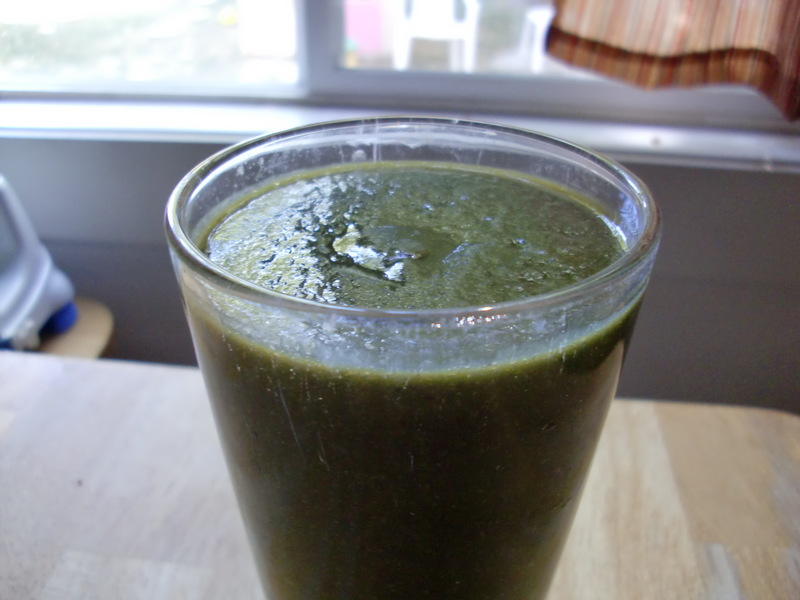 Once I experienced the silky-smooth green smoothies that machine could churn up, I was hooked. Well, that’s not entirely true, but I did become somewhat obsessed with finding a green smoothie combination that I loved. I tried apples, berries, bananas, oranges. Chard, kale, spinach. 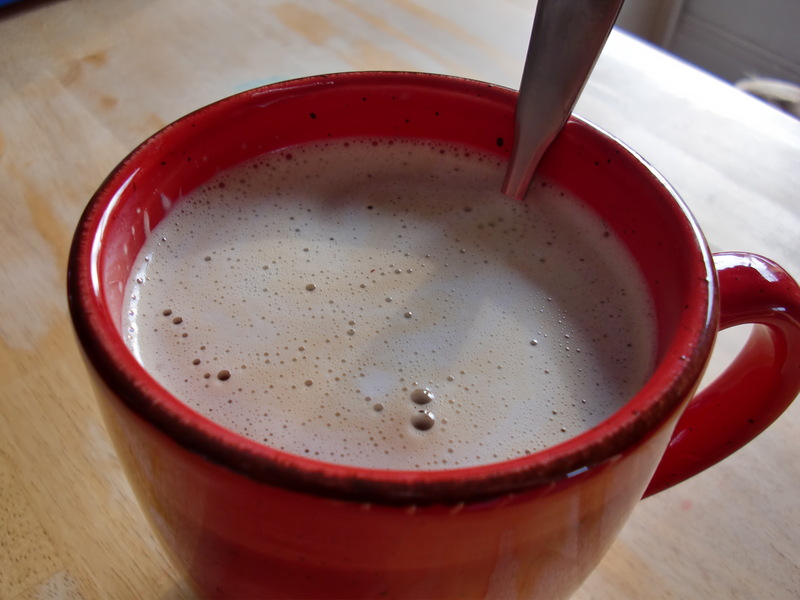 Cashew milk, almond milk, hazelnut milk, rice milk. Rice protein, hemp protein, flax seed powder. But I always ended up going back to my stand-by non-green smoothie. Until Renee’s birthday. Renee, for her birthday, hosted a green smoothie event. And she did something I hadn’t tried. She used orange juice as the liquid base for her smoothies. After I sipped that smoothie, the whole world took on a green tint. Then I was hooked. Back at home, I started making green smoothies again, adding more and more greens (even scary ones, like dandelion greens), trying new recipes, and even not adding any liquid at all! Then came Self-Care month and my resolution to eat veggies at every meal. In the beginning, I went with the easy stuff. Green smoothie for breakfast, frozen green beans or a green salad for lunch, corn on the cob for dinner. But soon I craved more greens. I started sauteing, boiling, and braising them for dinner. I’d toss them into spaghetti sauce and lentil soup. I even found a smothered pork chops variation that called for collard greens. But, except for the pork chops and a kale and blackeye peas recipe that called for bacon and its grease, I didn’t find a cooked greens recipe that really tasted, well, tasty. I contented myself with baking kale chips and snacking on those a couple of times a week. This past weekend, I was going through my new favorite cookbook, Feeding the Whole Family by Cynthia Lair. I was writing down the recipes we’d tried and loved along with several we hadn’t tried but I thought we might love. Perusing the “Got Color?” section, I saw a recipe I hadn’t noticed before. Sweet Apple Walnut Kale. I put it on the meal list. We had everything we needed to make it. So we made it. And here I am, sharing it with you. *The children did not agree with this assessment. More for Mommy. Oh, and I did make a couple of substitutions. I used maple sugar instead of brown sugar, vegan butter instead of cow butter, and rice vinegar instead of cider vinegar. A few weeks ago, I posted about a study that Ariel Gore wrote about in her book, Bluebird: Women and the New Psychology of Happiness. For those few of you who have not committed my posts to memory, the study found that people who kept a gratitude journal for six weeks reported an increase in happiness and a decrease in depressive symptoms. They experienced some improvement in as little as three weeks. Since reading this, I’ve been mulling over the idea of incorporating a gratitude practice into my Happiness Project, but I’ve yet to decide what form this practice will take. This may well have had a different result in a more individualistic country than it did in a more collectivist culture like Japan’s, but I still found this study compelling. The idea that I could feel happier simply by dwelling on the kind things I do every day is an interesting one to me. Knowing that memories are formed by laying down neural pathways, and neural pathways are reinforced by repeated use, it makes sense that traveling mentally back to the scene of a kind act could hardwire it in more firmly and make it easier to call up later on. If one has a clear sense of herself as someone who performs kind acts and is a helpful member of her community, I can see how that could lead her to feel more joy in her life. Or I could just vacillate a little longer. Week 8 Review: Hitting my Stride. Sort of. I’m writing this on Saturday afternoon and setting it to post Sunday, since illness has hit our family, and I figured I ought to make the most of a quiet moment while I have it since I don’t know what tomorrow will bring. Now that the month is nearly over, I finally feel more comfortable with this self-care thing. It’s amazing how quickly I’ve recalibrated so that now things that were a huge effort just a few weeks ago—like eating more vegetables, consuming no sugar or alcohol, and even getting more sleep—are now such necessities that I feel it acutely when I don’t follow my resolutions. My husband has a lot of omnivore pride: he can eat anything and is proud of it. He’s a healthy guy and finds my sensitivities to different food items a little mind-boggling. He accepts them and believes that they exist, he just doesn’t understand them. He does have a great appreciation for the value of sleep. While he’s got more empathy for my desire to sleep more, he’s had a little trouble adjusting to the reality that, if I go to bed at a reasonable time, I’m not staying up until all hours cleaning. Not that the house has ever been spotless as a result of my lost sleep, it’s just even less so when I’m well-rested. Recalibration has been a bit more of a challenge for him, I think, but we’re finding a new balance. I’ve been thinking a lot this week about acting as a team for the benefit of our family rather than keeping score of who’s done what. I find I hold a lot less resentment if I look at the things I do and the things my husband does as contributing to the well-being of our family as a whole than if I look at what he’s doing and what I’m doing as separate things. Friday night gave me a great example of this team effort in practice. Just as I was finishing the dishes and getting ready to go to bed, my daughter came into the kitchen crying and covered in partially digested dinner. I got her undressed, assessed the situation in her bedroom, and started her in the shower before I tapped my husband awake and apprised him of the situation. The baby was stable, so my husband came in and helped dry off our daughter after I’d gotten her all showered. I then set about spending 45 minutes cleaning up the mess in the bedroom while he manned the bucket and read books about mountain lions and bobcats. I was impressed throughout the entire time, both last night and all day today, how well he and I worked together to meet our own needs and the needs of the family. We didn’t once resort to comparing who had the tougher job, who got less sleep, who wasn’t pulling his or her weight. We had one little argument when, in a calm moment, I tried to talk about what I’d been doing before doing the dishes the night before, which was trying to figure out how to spend less money. But even then, we were able to identify the pattern we were falling into (this is a common argument at our house) and make the decision to table the discussion until we could give it the attention necessary to talk through it calmly. This is one of the benefits of self care that I hadn’t considered before I started: If I take care of myself when things are going well, I’m better prepared to handle adversity with aplomb than if my norm is operating just this side of losing it. It’s really very simple now that I see it, and I probably could have predicted this effect, but it’s different to experience the benefit than it is to theorize about it. I love Weiner’s writing style. Not only did I have fun while learning a lot about happiness as it relates to geographical location, but I now feel inspired to finally get a passport and go traveling. How long this plan will actually take to put into action is yet to be seen, but the desire to travel abroad feels delightfully unique to me. I really enjoyed reading about the paths to happiness different individuals and different cultures have taken. It’s given me a lot to think about (and post about on my blog). I’ve been playing around with the Morning Zing Green Smoothie recipe from rawfamily.com. [edit: that site no longer has that recipe. You can click here for the recipe on rawsmoothierecipes.com] Of the recipes on their page, I’ve tried only that one because it’s the one for which I have most of the ingredients lying around most of the time. The other day, I put what I had into the blender (1/2 bunch dandelion greens, 2 peaches, a can of pineapple, a couple shakes of ground dried ginger), added 4 ice cubes, and whirred it up. It made about 4 cups of thick, somewhat bitter smoothie. After about 1 cup of it, the flavor kind of grew on me. I drank a pint in the morning and a pint in the afternoon. The baby loved it. He’d take a sip and then smile and clap his hands. My daughter wouldn’t even get near it. I’m pleased that I drank such an extremely green smoothie, but I think I’ll keep my greens/bananas/berries smoothie as my staple and use the Morning Zing just on special occasions. I think it would be perfect for St Patrick’s Day. 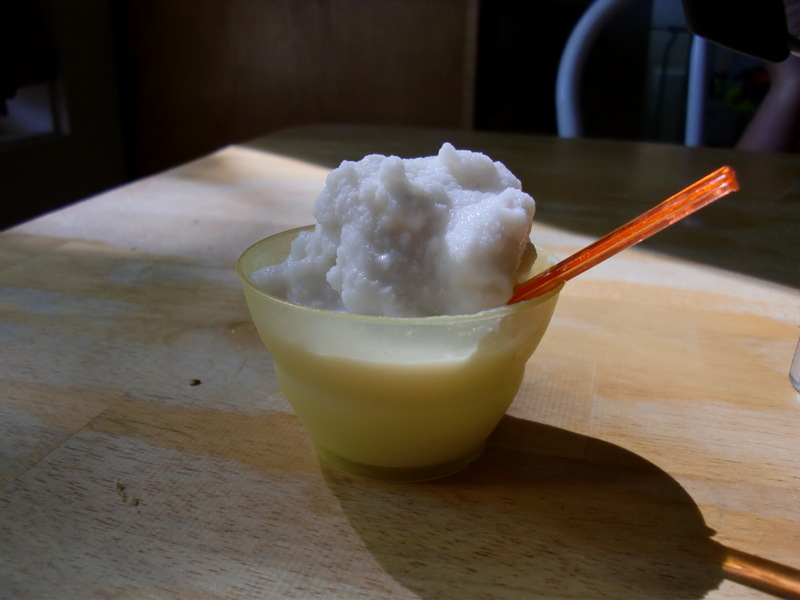 I modified a recipe from the VitaMix cookbook to make this dairy-free, cane-sugar-free ice cream. If you count the time it takes to eat, this is actually 10-minute ice cream. Place all ingredients in VitaMix. Turn machine on low, variable speed 1 and quickly turn variable speed to 10 and then to high. Blend for about 30-60 seconds until the sound of the motor changes and four mounds appear on the top of the mixture. Be careful not to blend too long or the ice cream will be too melty. Made “properly,” this makes an ice cream of soft-serve consistency. I think I might try maple syrup as the sweetener next time, if the kids are amenable. I don’t see any reason you couldn’t use any sweetener you’d like in this, just modify the amount to suit your tastes and the sweetener. My daughter asked to make apple pie for the first day of autumn. She apparently got the idea from the book Apple Pie 4th of July by Janet Wong. As the title suggests, they bake an apple pie for Independence Day, but my daughter expanded upon the idea and made what I thought was a suggestion very appropriate to the season. I don’t bake much pie. I make a squash pie a couple of times a year, but gluten-free pie crust is a real pain to work with, so I avoid it except on special occasions, like when I really want pie. And I don’t think I’ve ever made a double-crust pie as an adult. 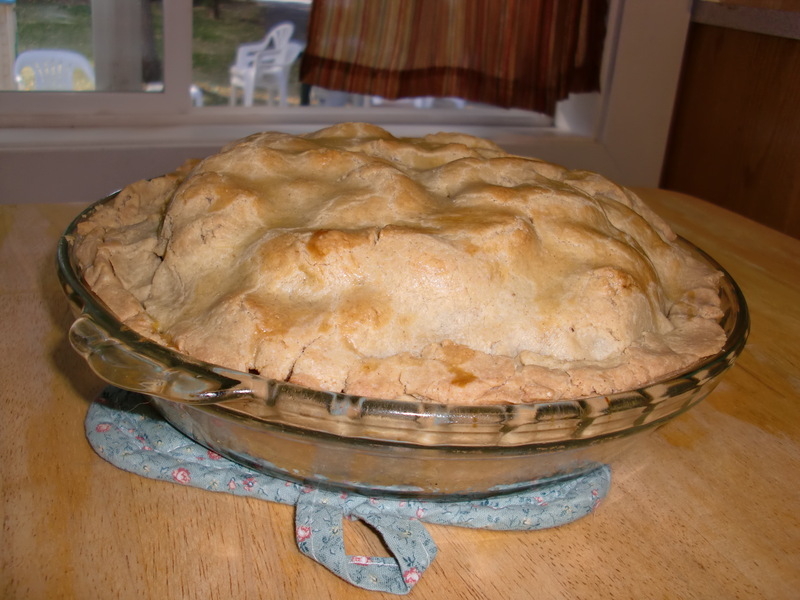 I used to help my mom bake apple and cherry pies, so I wasn’t flying totally blind, but I knew that I was running a risk by making a pie from scratch with my 5-year-old while my 13-month-old toddled about trying to climb up the stool and open the hot stove. To lessen the chance of emotional explosion during pie prep, I peeled, cored, and chopped the apples last night. I was going to make the dough for the crust, but my husband suggested our daughter might be disappointed that she didn’t get to measure and pour the ingredients, so I waited. And went to bed early. As luck would have it, I got about an hour of solitude before either child woke up for the morning, during which I sipped my tea and watched the clouds race across the sky (and then did dishes and checked e-mail). When my daughter awoke, we started on the pie immediately. When the baby woke up about 20 minutes later, I strapped him to my back, and we went back to work. As predicted, the dough was temperamental and there was more filling than I’d counted on, but I managed to fit everything in and kind of tuck the crust around the edges. If it’s worth doing, it’s worth doing poorly. We’re in that period full of possibility when we don’t know yet whether the pie will taste as good as we anticipate (or even if I cooked it long enough). For now, we’re just enjoying looking at the results of our work and enjoying the smell of apples and cinnamon. I might even make some vanilla ice cream to go with the pie tonight. And I can say honestly that baking with my daughter was a thoroughly enjoyable experience this morning. Happy Autumn! …coming home from the gym and seeing the kids lying in the grass with the babysitter so engrossed in their looking-at-the-sky game that they don’t even notice me, and I get to sneak inside and have a shower all by myself before going back on Mommy Duty.